Stormwater management facilities are structures that are used to remove pollutants from waterways, prevent stream damage and erosion, prevent flooding, and protect public health. These structures can be located on the surface (gutters, swales, channels, stormwater retention and detention basins, catch basins, rain gardens etc. ), underground (stormwater piping, infiltration trenches, oil-water separators, underground storage structures etc. ), or even on the roofs of buildings (vegetated "green roofs"). These facilities require periodic maintenance to operate effectively. This tool presents the basis for establishing an operation and maintenance plan for all storm water facilities within an organization's jurisdiction. Energy Conservation: The implementation of a properly written and designed Stormwater Facilities Operation and Maintenance Plan agreement can ensure the optimum operation of the facility, thus reducing the potential need for energy-intensive repairs and remediation measures. Preventive Maintenance: Identifying maintenance issues before they escalate into system failures can save time and money. Improved Scheduling: Scheduling and budgeting for periodic maintenance can be programmed more appropriately. Limited Funding: Scarce funding resources must be devoted to implement the stormwater facilities operation and maintenance plan. Limited Evidence of Impending Problems: A properly operating Stormwater Facilities Operation and Maintenance system may not show any obvious evidence of pending failure, and operators must be aware that periodic maintenance is still necessary to an apparently-properly functioning system. Specialized Equipment: Some forms of maintenance can require special equipment (such as vacuuming pervious pavement or cleaning subsurface storage basins). Lack of Expertise: In some situations, the administration of the Stormwater Facilities Operation and Maintenance Plan by an organization such as a Home Owners' Association, may be inadequate because of limited expertise. Requirements for the long term maintenance of all stormwater management facilities should be incorporated into municipal ordinance language. The introductory paragraph to the Pennsylvania Municipalities Planning Code empowers all municipalities to enact ordinances that, among other things, promote the conservation of energy. Pocopson Township's stormwater management regulations are located at Code Chapter 71 Stormwater Management: Maintenance Responsibilities, Sections 26-30. West Goshen Township's stormwater management regulations. East Vincent Township Subdivision and Land Development Ordinance Section 22-426.9 Stormwater BMP Operations and Maintenance. The Chester County Water Resources Authority provides storm water management public education brochures. The Pennsylvania Storm Water Management Act (Act 167) was adopted in response to the impacts of accelerated stormwater runoff resulting from land development in the state. It requires counties to prepare and adopt watershed based stormwater management plans. It also requires municipalities to adopt and implement ordinances to regulate development consistent with these plans. 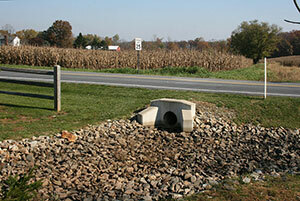 The Chester County Water Resources Authority has prepared a Stormwater Management Plan. Watersheds, An Integrated Water Resources Plan for Chester County, Pennsylvania and its Watersheds, is the adopted Water Resources Element of the 1996 Chester County Comprehensive Plan, Landscapes. Watersheds includes recommended practices to preserve and improve the water quality and management in Chester County.